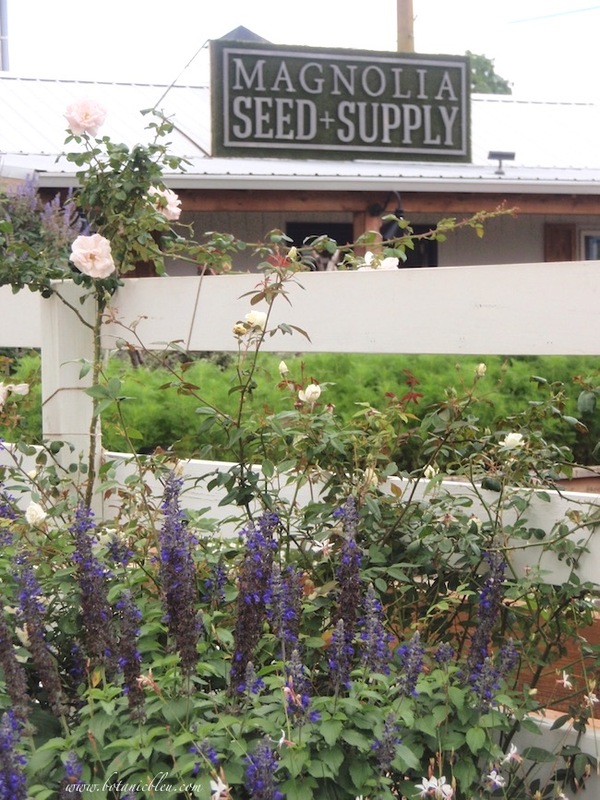 MAGNOLIA SEED + SUPPLY is the name of Joanna and Chip Gaines' garden shed located in the heart of their flower beds and vegetable gardens. Of course, their shed is not a working shed, but a kind of model shed with gardening items to buy. Now, you don't have to name your garden shed, but I (rather my family) did name mine, le Jardin Château (garden castle,) long before Magnolia Market existed. I don't have a sign with my garden shed's name on it, but after seeing Magnolia's sign, I'm now thinking about it. 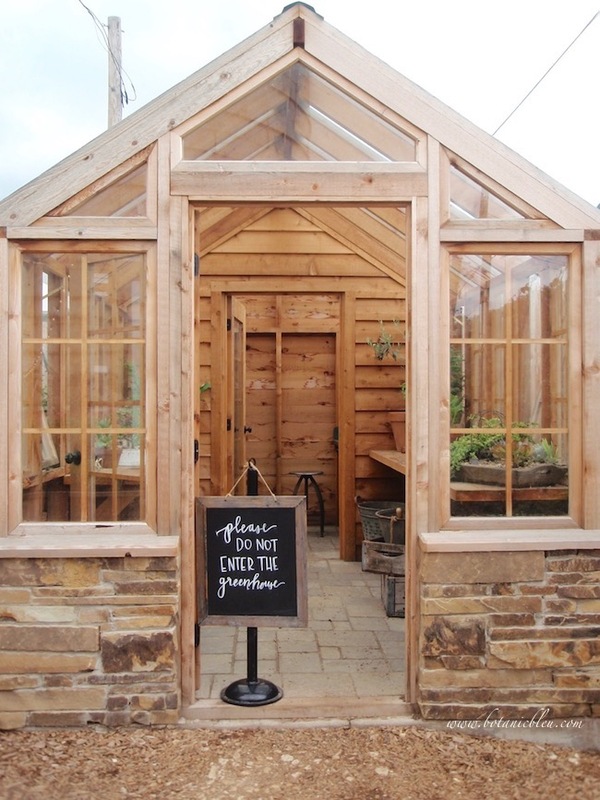 What is in your DREAM garden shed? If money, time, and sources are no object? Signs ... to organize and identify the contents. How about a large wooden GARDEN sign or chalkboard plant signs? Plants ... succulents in bedding trays before planting. Shelves ... to store gardening tools. 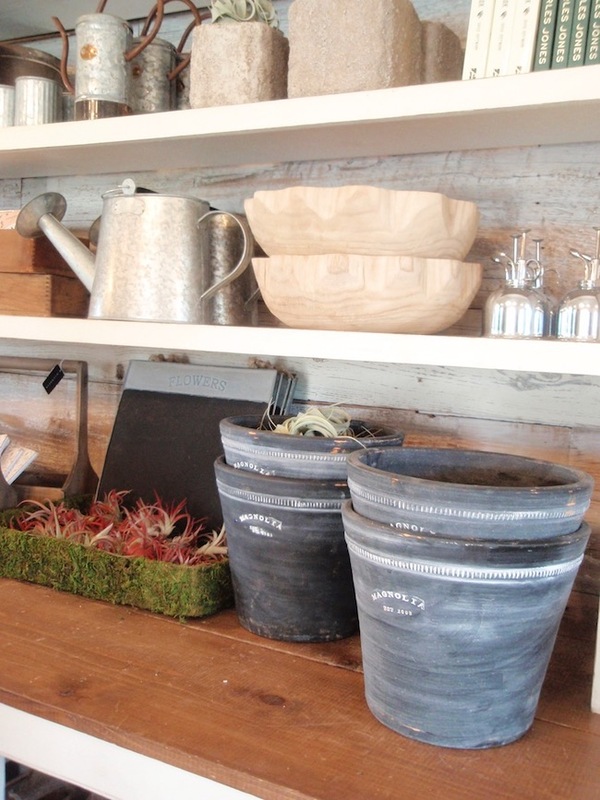 Watering cans, books, seed packets, flower misters, wooden hand tool boxes. Or, your very own personalized clay pots. 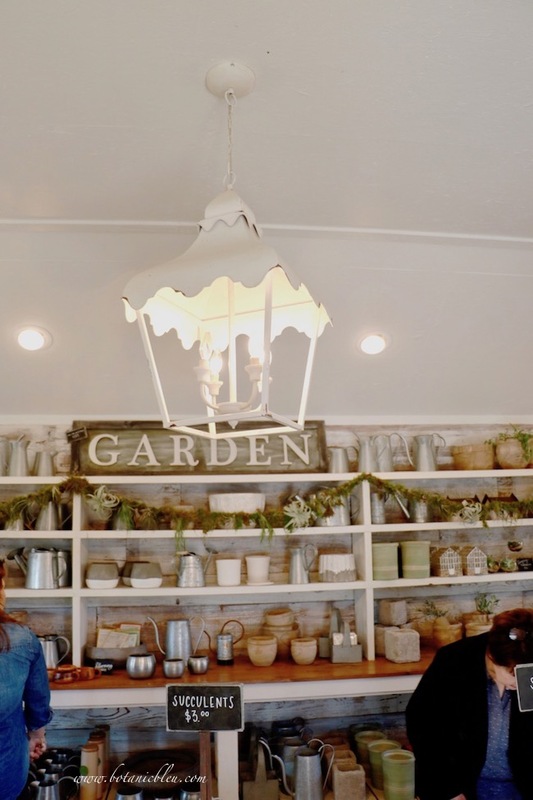 Do you remember the Fixer Upper episode in which Joanna had a local artisan create a set of dishes with the home owner's last name on each piece? So much in this photo speaks to the heart of garden shed lovers everywhere. Brick floors ... set in a herringbone pattern. Perfect for splashing water, dropping dirt, and muddy shoes from working in a garden shed. Wooden counter ... with a THICK wooden vintage-looking unpainted top, raised white wood paneling base, wood baseboard, and wood trim under the countertop. Wire baskets ... on the countertop and attached to the counter's side. Chippy white wood ... horizontal shiplap boards on the walls and as window trim. Interior window awnings ... rustic metal roofing can withstand dirt and water in a working garden shed. No fabric curtains inside a real garden shed. 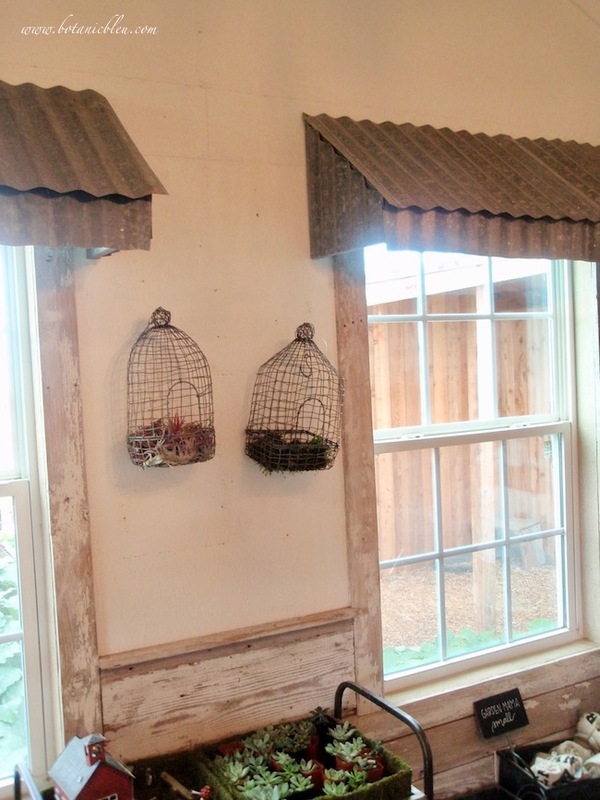 Wire bird cages ... wall decor with personality. Wooden cabinet ... storage space galore for your gardening supplies. 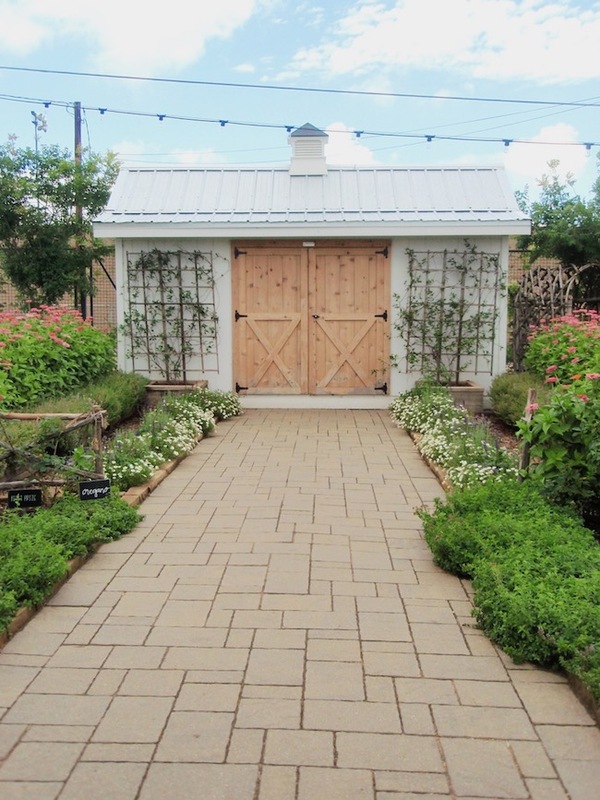 Check out the design features for a tool shed in a garden. The building looks large enough to house both large equipment and supplies like large bags of potting soil, mulch, and fertilizer. Shovels, rakes, and hoses could also make their home in a large tool shed. Large paved walkway ... for moving lawn mowers, tillers, and wagons. Double wooden doors ... for accessing the space without problems. 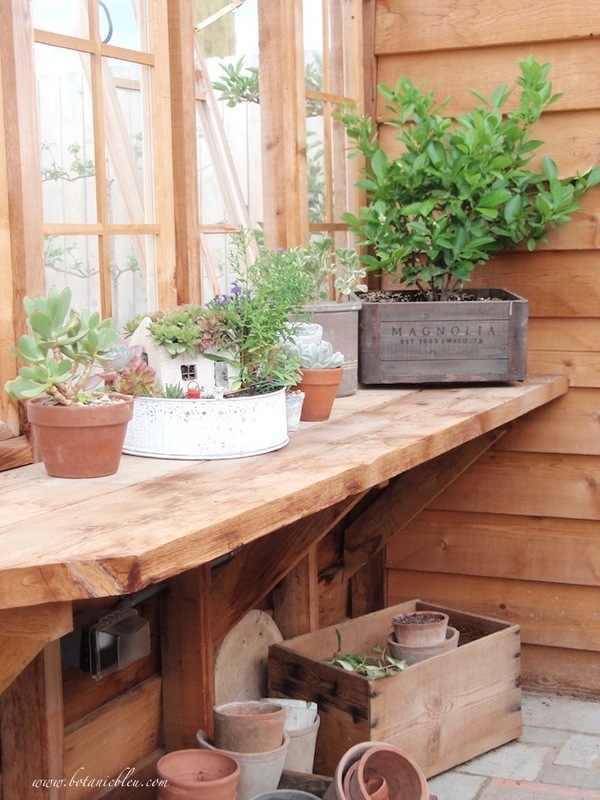 Trellis planters ... for adding style to the shed and for more gardening areas. Metal roof ... for farmhouse country style and for withstanding hailstorms in the spring in Texas. Louvered cupola ... for looks and possibly for ventilation. A greenhouse is best located close to other garden structures and planting areas. 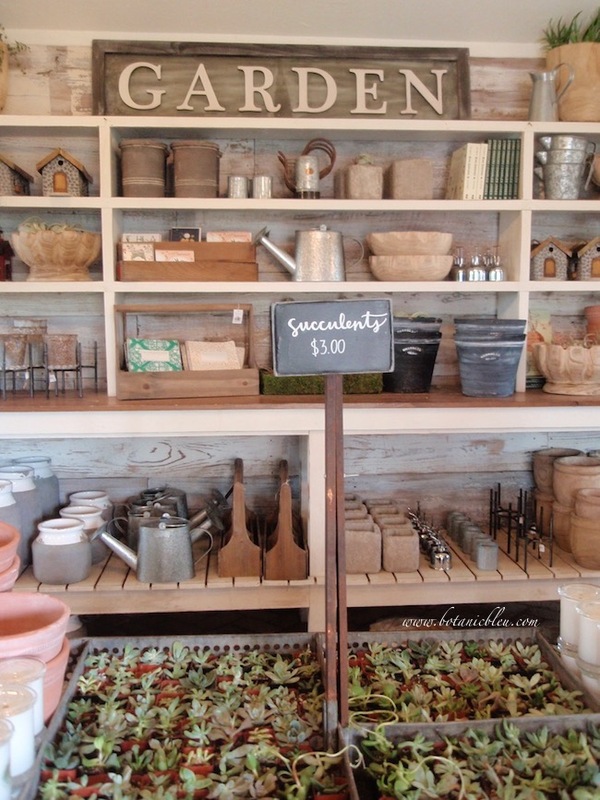 The Magnolia Market greenhouse is right next door to the SEED + SUPPLY garden shed. 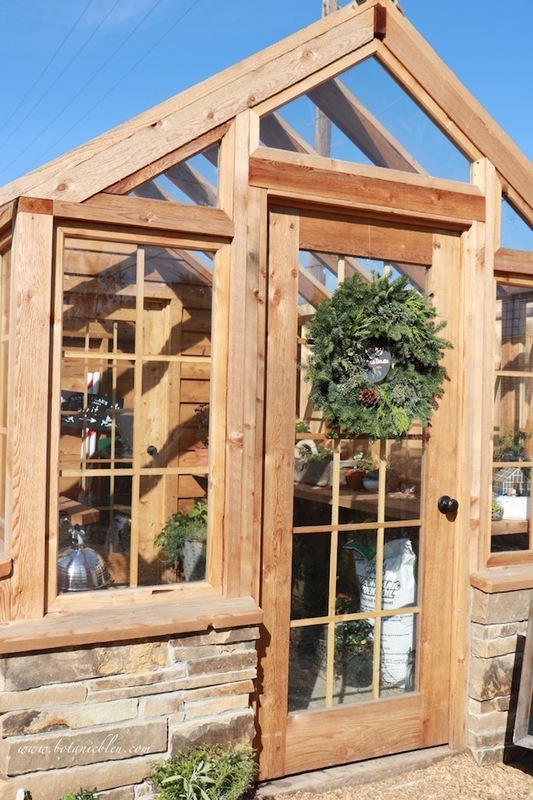 Cedar frame ... deters rot and insects. Roof windows ... provide lots of solar heat for plants during the winter months. Stone half wall ... adds contrasting texture to the design and some small shady spots inside below the windows. 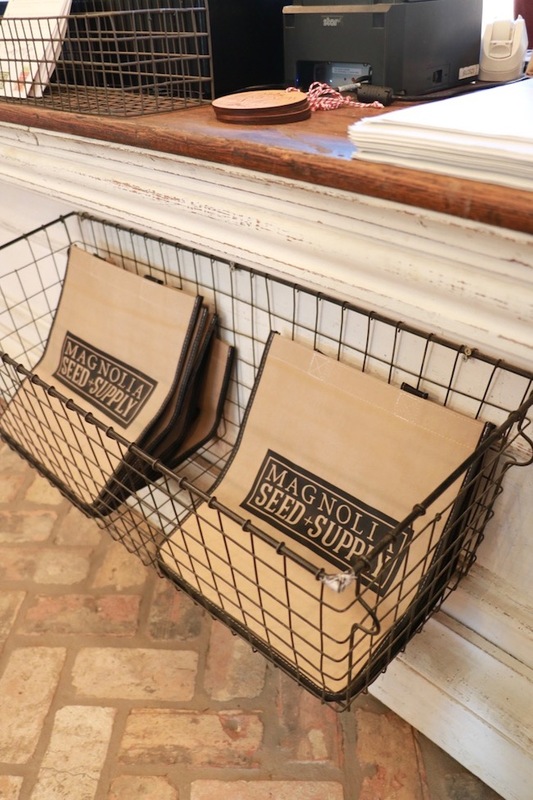 There is an enclosed section at the back that could be used to store supplies. Stone pavers ... for the floor are a less expensive option than a brick floor, but provide the same benefits. Gravel or mulch ... covers the ground around the greenhouse and prevents mud holes. Shelves ... thick cedar shelves will take a beating, deter insects, and deter rot from water splashes. 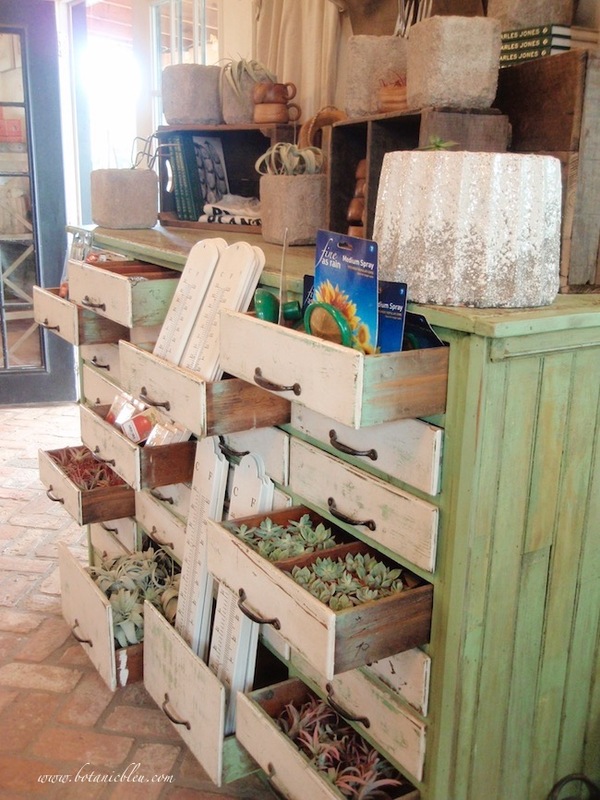 Wooden boxes ... handy for organizing and for plants. Another wooden box ... with metal reinforced corners and handles. 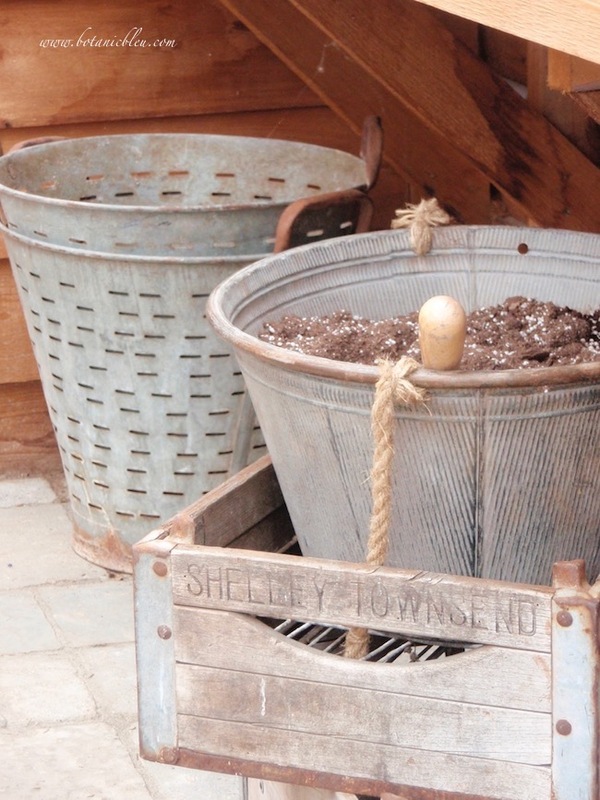 Metal buckets ... great for holding extra potting soil. 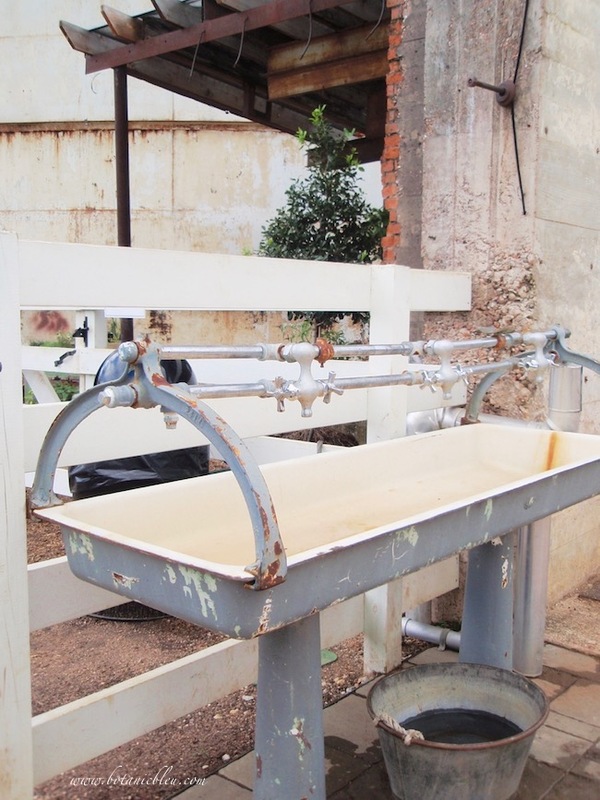 A long exterior industrial size sink provides water from multiple faucets for cleaning tools and for watering plants in large pots. More than one person can work at the same time. I don't need as large a sink, but an outdoor sink can be a big help. Douse ... plants and vegetables before taking them into the house. Reduces dirt inside and washes away critters catching a ride inside. 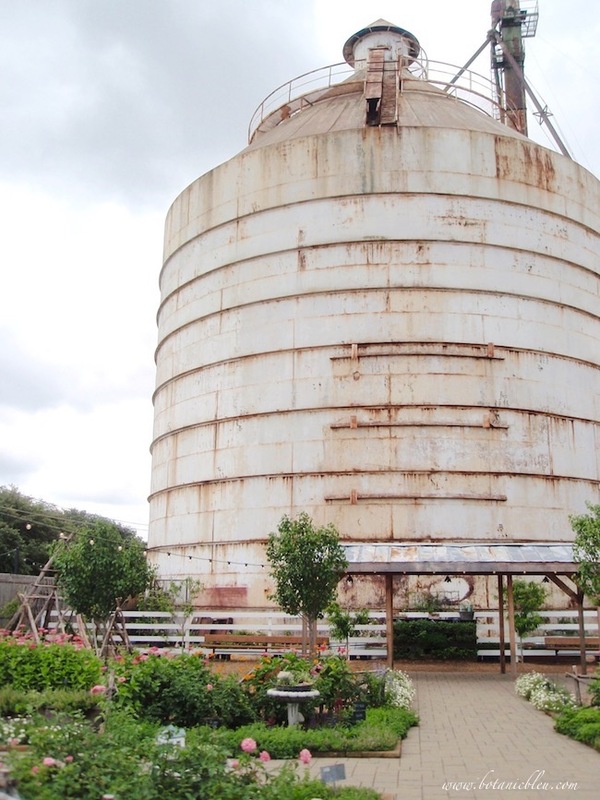 Do you have a vintage structure in your yard or garden? Take a cue from the Gaines, and make it a focal point. What possibly could be considered an eyesore worthy of being torn down can become the prime accent when integrated into the overall plan. Coming soon --- photos of new French-design urns and plants in my garden. I still like your shed the best! Thank you. I do love my little French-inspired garden shed, too. It looks terrific, Judith. And loads of good ideas. Also, I really appreciate that you aren't a sponsored blog -- it makes me trust your recommendations more. It’s fun to dream about how amazing my landscape would be with even a few of these Magnolia touches. Thank you for such great visuals. I agree that even a few Magnolia touches transform a space! I do like Joanna Gaines style. She does have a gift! I need to decorate the shelves in my green house. It's been cleaned out but the wasps and hornets really like nesting inside. I've loved this series Judith. Thanks for sharing at Keep In Touch. Thank you, Katie. I'm always looking for inspiration for my gardens and garden shed. Analyzing others' spaces helps me choose things for my areas. So many lovely inspirations. This totally motivates me. Thanks Judith for sharing at our May garden party. Even when I do not buy anything at Magnolia Market, I always come away with some inspiration. I visited Magnolia in March, the garden area was my favorite! Thanks for sharing this great post with our garden party. I'll be sharing a feature post tomorrow and you will be one of them.